There is one particular subject on the Rules of Golf that I have great difficulty in explaining in terms that can easily be understood (just ask my wife!). And yet, it concerns an important area that every golfer must get right if they are to play the game properly. It is of course, Nearest Point of Relief. The reason it is so important is that you cannot play many rounds of golf without coming across one of these four circumstances that require dropping at the nearest point of relief. Interference to your stance, or area of swing by an immovable obstruction. Examples of immovable obstructions are artificial paths, fences, bridges, or fixed course furniture, like ball washers, benches or direction posts. Interference from an abnormal ground condition. Under the Rules there are three types of abnormal ground condition; areas of casual water, ground under repair as designated by a Committee, or a hole, cast or runway made by a burrowing animal, reptile or bird. When your ball lies on a wrong putting green, which is any putting green other than the one on the hole being played, including the practice putting green. When there is a Local Rule protecting young (staked) trees. In the first two situations the player may take relief, without penalty, by dropping a ball within one club length of the nearest point of relief; relief from a wrong putting green is mandatory; and Local Rules affording relief from protected trees that are in the intended area of stance or swing are usually mandatory. Now let me get to the point that most, yes most, players get wrong. There is only one physical point on the golf course that qualifies as the nearest point of relief. OK, so very occasionally there could be two equidistant points, but let’s ignore that detail for the purpose of this article. That nearest point could be in deep rough, in the middle of a bush, behind a wall that is not in the intended area of swing, or even within the trunk of a tree. Yes, you did read that correctly, the nearest point of relief may be within the trunk of a tree. So, how do you measure the club-length in which you may drop your ball if that is the case? The answer to that is that you have to estimate the distance; so, if nearest point is in the centre of the tree trunk and the radius of the tree is half a club-length, then you may drop within another half club-length from the edge of the tree, not nearer the hole. The mistake that many players make is that they think that when they are taking relief in one of the above circumstances it means that they get relief from anything that makes their next stroke difficult and drop a ball where it suits them. This is wrong. It is always the nearest point of relief from interference from whatever the Rules permit (e.g. pathway, bench, casual water, wrong putting green) and nowhere else. The player may not choose the nicest point of relief; you may only drop within a club-length of the nearest point of relief, not nearer the hole. For this reason you should always determine where the nearest point is before you lift your ball, in case it happens to be in a position that is even more unfavourable than your current lie. “It is the reference point for taking relief without penalty from interference by an immovable obstruction (Rule 24-2), an abnormal ground condition (Rule 25-1) or a wrong putting green (Rule 25-3). "Q. In proceeding under Rule 24-2b(i) or Rule 25-1b(i), the Definition of Nearest Point of Relief provides that to determine the nearest point of relief accurately, the player should use the club, address position, direction of play and swing (right or left-handed) that he would have used from the original position had the obstruction or condition not been there. What is the procedure if a player is unable physically to determine the nearest point of relief because, for example, that point is within the trunk of a tree or a boundary fence prevents the player from adopting the required address position? A. The nearest point of relief in both cases must be estimated and the player must drop the ball within one club-length of the estimated point, not nearer the hole. "The diagram illustrates the point raised in Decision 24-2b/3.5 where a player may be unable to determine the nearest point of relief from an immovable obstruction and will need to estimate this point under Rule 24-2b. S3 = notional stance used to determine nearest point of relief at P3 – unable to take this stance because of tree trunk"
I included a short, explanatory video on how to find the nearest point of relief in an earlier blog. Check it out. I've had a great reaction to my new ‘Rhodes Rules School’ series of weekly emails that pose questions on the Rules based on an accompanying photo, or photos. Thanks to all of the (nearly) three thousand subscribers, so far. Don’t worry if you haven’t subscribed yet because you will not miss anything. When you do subscribe here you will start receiving the series of emails, one per week, starting from the very first one. All new subscribers also receive a small gift, a link to 27 Q&As on the Rules (9 easy, 9 slightly harder and 9 more difficult), which you might like to use to test yourself and your Clubhouse friends. Of course, there is no charge and you can unsubscribe at any time. Here is the link again. This is indeed an area that I have difficulty explaining to others, particularly where nearest point of relief is in the middle of a tree. I suspect that most golfers would take one look at a boundary wall/fence and automatically seek relief eleswhere. By the way, relief under Rule 25-3 (Wrong Putting Green) is manadatory. Good spot, I will edit it straight away. Day in and out, this may be the most violated rule in golf. There is no need to carry a thesaurus. Just learn the correct procedure once and it stays with you for the rest of your life. Then, you help others to do it properly. Easy! What would be the procedure if the nearest point of relief from the current interference was another? For instance, if a bench impedes my swing and the nearest point of relief is an area of ground covered with rabbit burrows what is the procedure? Do I drop within 1 club length there and if I am then impeded by the burrows take relief again? Yes, you may drop your ball away from the bench according to the Rules and then if another immovable obstruction or abnormal ground condition interferes you may take relief again. But you may not take relief from the two conditions at the same time (Decision 25-1b/11.5). Whilst this is only tangential to the subject at hand, I would ask your views on what has always seemed to me a ruling that invites cheating and that goes against the spirit of the game. Let us say I am right-handed (in fact I am left-handed, but for the sake of this example, let's say I am not). My ball comes to rest very close (say, six inches) to the right-hand side of a large and sturdy tree. I am unable to play a normal right-handed stroke because of the tree. If in this case I decide to play LEFT-handed, I notice with some glee that my stance would be interfered with by a fortuitous patch of casual water. According to everything I have read on Rule 25-1, I can claim relief for standing in casual water for that left-handed stroke, and having done so and having dropped without penalty, I may then continue by playing EITHER left-handed OR (in this case, pretty obviously) right-handed. It strikes me that it was my misfortune/stupidity to whack the ball next to a tree in the first place, and that to play fast and loose with: "I'll play this left-handed, thanks... Uh, no... on second thoughts, I'll play this right-handed after all" is not exactly honest. And yet it is permitted. I am hardly likely to endear myself to other players for suggesting it, but common sense somehow says that if one elects to play "the other way around", one should indeed put one's money where one's mouth is and DO AS YOU HAVE SAID. I do understand the reservation that you have with this Rule, which to my knowledge is is shared by others. However, whilst on this occasion the Rules work in favour of the player there are many (more?) occasions when they work against. For example, the nearest point of relief from deep casual water on a fairway may be in deep rough, or behind a tree. I am a high handicap golfer but there have been times where even I will play a left handed stroke in order to progress my ball a few yards, when the only other alternative is to deem my ball unplayable and take a penalty drop, with the attendant risk that my ball may roll to another unplayable position. "A player may not take relief under this Rule if (a) it is clearly unreasonable for him to make a stroke because of interference by anything other than an abnormal ground condition or (b) interference by an abnormal ground condition would occur only through use of an unnecessarily abnormal stance, swing or direction of play." So, the player would only get relief from the casual water in your scenario if the left-handed stroke was a reasonable one to make in the circumstances. What should happen when the nearest point of relief in ground under repair would cause the ball to be dropped out of bounds? I refer to a situation in my club where there is an OOB line between two holes and a ground under repair area, denoted by a line, that is besected by the OOB line. If I understand your question correctly, there will almost always be a nearest point of relief that is on the course, i.e. not out of bounds and not nearer the hole. There is no restriction on how far away this point is from where the ball is at rest in the GUR. If there is not, then the player may either play the ball from where it lies in GUR, providing there is not a Local Rule prohibiting this, or go back to where they played their last stroke from and drop a ball there under penalty of stroke and distance. Interesting situation today. A player drove the ball into a burrowing animal hole which was at the base of a tree (on the tee side of the tree). We assumed that the player got relief from the burrowing animal hole and not the tree. We further assumed that the player could choose either side of the hole as relief and that relief was defined as "outside" the burrowing animal hole. Was this correct? No it was not correct. As I tried to explain above, the procedure for taking relief from an abnormal ground position is to determine the nearest point of relief, and then drop the ball within a club-length of that point not nearer the hole. The player does not get to choose which side to drop and the relief does not necessarily mean that the player will have a clear shot to the green, where the tree does not interfere with their lie, stance or area of swing. When the ball is in the GUR which is in the putting green then if the nearest point of relief is outside the green but do I get a relief if there is aeration plug holes in between my nearest point of relief and the hole. Can we proceed as per rule 25-1b/10.5 illustration for determining the nearest point of relief on GUR in putting green. There is no relief from aeration holes, unless there is a Local Rule that states otherwise (Decision 25/15). So, Decision 25-1b/10.5 is not relevant to your question. I think that you may benefit from reading my blog of 15th April 2010 on the subject of Nearest Point of Relief (NPR) (http://www.barryrhodes.com/2010/04/nearest-point-of-relief.html). If, in determining the NPR, you take a normal stance from what you are taking relief from, using the club that you would have used if the interference was not there, and part of that stance happens to be in an area marked GUR, you must still drop your ball in accordance with the Rules. If the ball when it comes to rest, or your stance, is within the GUR you may then take relief from that interference in the same way. Decision 24-2b/10 is also relevant. As a right handed player, is it ok to play a left handed club (with a reverse swing of course) to get away from behind a tree that blocks my swing? Yes, there are a number of players that carry one club that is the 'wrong way round' for how they usually play. There is no restriction in the Rules as to the mix of clubs that you carry, providing they are conforming clubs and you start with a maximum of 14. Please help. Where in the rules and decisions do they state the procedure for determining the relief drop area for example; from a road or GUR? More specifically, the intended dropping area. Do you need to mark it with one or two pecks? The Definitions section at the front of the Rules book defines how a player should determine the nearest point of relief. There is no requirement to mark either the nearest point of relief or the extent of the permitted club-length, though it is good practice to do so, as the player can be penalised if he drops a ball and plays it from outside that area. Hi Barry. Looking at the diagram above and continuing the scenario if I drop the ball close to point P1 or P2 and the ball stayed there (didn't roll away) I would only have a left handed swing available to me because of the boundary wall with my feet on the path. In this case I would start the nearest point of relief again using a left handed stance and find myself back on the other side of the path ! In which case one club length (driver) would then let me take a right handed stance again, clear of the path, albeit with restricted swing from that tree. Yes, providing the left-handed stroke was reasonable and the player was not using an unnecessarily abnormal stance, swing or direction of play, then the NPR may indeed have been on the other side of the path. Having dropped the ball according to the Rules the player may then revert to a right-handed stroke. You did not cover the local rule in effect section of rule 25-1. This rule eliminates interference. In short, you can make your stroke while standing in the abnormal area, such as a cart path, and drop the ball anywhere within one club length of the edge of the cart path. You are confusing two Rules! Rule 25-1 deals with abnormal ground conditions (e.g. GUR, casual water) and has nothing to do with cart paths, which are immovable obstructions, Rule 24-2. I have never seen a Local Rule similar to what you are suggesting, which does not conform to the specimen Local Rules in Appendix l, Part B of the Rules of Golf. Now, what if my ball comes to rest in a puddle if water on a cart path??? This happened to me. Think about it logically. You may take relief from the casual water and if your dropped ball comes to rest on the path again you may then take relief from the path; or you may take the relief from the path the first time, without taking relief from the casual water. Hi Barry. Today, while i was preparing to take relief from the cart path, fellow competitor told me that while dropping the ball i must not stand on the path. I have never heard of such a thing and i think he confused 'full and complete relief' when playing the next shot with such relief when dropping. No problem for me as i moved a foot away. He was not a native english speaker and i had no real argument. Ever hear of such a condition for dropping? There is no condition for where a player stands while dropping a ball under the Rules. An interesting example is that a player may stand in a bunker to drop a ball outside the bunker, thereby taking advantage of their outstretched arm being closer to the ground than if they stood outside the bunker. If I take a drop for a rabbit scrape, and once I drop the ball it rolls which brings a completely different scrape into play - do I re drop the ball as it is still interfered with by a scrape (although different to the original) or do I take fresh relief from the new situation? You must take the appropriate relief from the new interference situation. In your diagram above, if the ball is at position B3 but the direction of play is ^ (up, instead of left), then where is the nearest point of relief? My understanding is that you cannot drop nearer the hole from the actual nearest point of relief (so within a club length would be closer to the hole than the nearest point of relief). You are correct that you may not drop a ball closer to the hole in taking relief from a path. If the hole was immediately north of B3 then the nearest point of relief is either to the left or right of B3, or if the hole is some distance away it could even be on the far side of the path, which would be just in front of the boundary wall, giving a very unfavourable lie. The diagram is obviously not to scale, so it is difficult to give an exact nearest point of relief; it could even be that the player would be better of playing from the path. 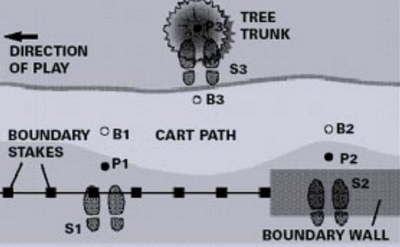 A common point of debate at our club about NPR on a cart path falls into 2 sides. One side holds that the nearest point is that side of the path closest to the ball and the ball is dropped to give full relief of both swing and stance. The other side says the NPR is determined by measuring the distance from where the ball lies on the path to where it must be dropped to give the player relief for both swing and stance. So if a ball lies close to the middle the NPR might be across the wider part of the path depending on whether the player is left or right handed. Can you clear this up please? The second interpretation is the correct one; the stance has to be taken into account when determining the nearest point of relief (NPR). So, the NPR for a right-handed player will be on the other side than for a left-handed player if the ball is at rest in the middle of the path. I have printed out your page and will keep it in my bag. I played in a matchplay event today and my opponent landed on a path and what i considered the nearest point of relief was immediately behind in deep vegetation. My opponent disagreed, his captain disagreed and even my captain disagreed and they have all been playing in this particular club team event for longer than i.
I gave up my argument, suffice to say it won't be happening again. Thanks for the info and the ammunition. In match play, always remember that you make a claim during play of the hole and seek an 'official' ruling. In this case, you would have won the hole because your opponent played from the wrong place and this could have affected the result of your match, even if the ruling was not received until much later..
Hi Barry . In taking a stance for a ball just in bounds, my stance was now out of bounds and affected by a rabbit hole. This was not an abnormal stance or direction of stroke for that situation. Do I get relief from such conditions beyond the out of bounds? There is no relief from an abnormal ground condition (which includes a hole made by a rabbit) that is not on the course. See Definition of Abnormal Ground Condition. my ball came to rest on left side of a cart path. to the left of cart path was about 2 feet strop of ground and then there is a lateral hazard (fence). The nearest point of relief would have been right beside the path and my swing would be restricted by the fence., however if i take the one club relief to which I am entitled drop would be in the hard. Am I now entitled to drop on the right of cart path ? You must take relief from the path having determinerd the NPR and dropping the ball within one club-length of that point not nearer the hole and see where the ball comes to rest. If the fence, an immovable obstruction, then interferes with your intended stroke you must determine the new NPR and drop the ball on the path and see where it comes to rest. If it obvious that this repeating this procedure will result in you being back where you started, you may then lift the ball and drop it within one club-length of and not nearer the hole than the nearest point of relief, on a part of the course which avoids interference by the path and the fence and is not in a hazard or on a putting green. Decision 1-4/8 details the procedure that nmust be followed in these uncommon situations. If the ball lands an inch to the right of a staked sapling or a distance post that cannot be removed, and the player is right handed, is the nearest point of relief on the left side of the tree or post. This possible NPR point would be perhaps a foot away or does the NPR have to stay on the right hand side of the tree or post so once a stance has been taken and the NPR ball position identified, this distance would be greater than a spot on the left hand side of the staked tree or distance post. Providing of course there is a local rule to allow or require relief from the staked tree. The nearest point of relief is a matter of fact. Remember that in the case of a staked tree (where there is a Local Rule mandating relief) it is the whole tree, including branches and leaves, not just the trunk and the stake. So a player should determine where the NPR is where there is no interference from any part of the tree and then drop the ball within one club-length of that point not nearer the hole. Of course, this could be in a lass favourable place. It is not possible for me to give a definitive answer to your question. There is only one NPR, which differs for a left-handed and right-handed player, except very occasionally when there could be two equidistant points. I had a friend who hit his drive right of the cart path by 1 foot. When we arrived at the the ball we realized that just right of ball was the out of bounds stakes. In order to hit his ball his stance was on cart path. He argued that if he takes relief from the cart path on the correct side that would place him out of bounds so he gets relief from the left side of cart path. Is this correct? Your friend was almost certainly wrong. If you carefully read the second part of Decision 24-2b/3.5, together with the diagram in Decision 24-2b/3.7, (both in the blog above) you will see that there are even occasions when a player must estimate the NPR because an OOB boundary wall means that they cannot properly take a stance. I suspect that in the situation that you describe the player's best option was to play their ball as it lay with their stance on the path. I think what Jeffey meant was that if his friend took relief on the right side of the path then his friends ball would be OOB whilst his friends feet would be just right of the path. As the NPR can't be OOB he is asking if his friend was right in dropping on the left hand side of the path. All things being equal (OOB running paralel with Path) then I think his friend was correct or am I missing something? I accept your point if the area between the path and the course boundary was 30 inches, or less, but if this was the case, in my opinion, the Committee should consider making the boundary the course side of the path. My issue is with the choice of club to determine nearest point of relief. The rule uses the word"should" in saying which club to use. But should is a verb that is recommendatory as opposed to "must" which is compulsory. So may I use a driver or a putter to determine NPR in case my ball is lying on a cartpath ? You may, but if you then drop your ball outside of the area that the definition of NPR permits, using the club which you would have used for your next stroke if the condition were not there, you will incur a penalty for playing from a wrong place. Remember that no club-lengths have to be measured, providing the ball is dropped within the area permitted by the Rule. Of course, the club that a player would use is subjective and it would be for a Committee to make a ruling on if a dispute arose. Thanks Barry for the prompt response. Perhaps I did not make my question clear. The rule states that a player SHOULD be using the club which you would have used for your next stroke if the condition were not there. My question is only on the use of the verb "should" instead of "must". "Should' as per the dictionary is recommendatory and not compulsory. Which means that I can reject the "recommendation" and use any club I want. Would that be correct in determining NPR? I did understand your question, which is one that many ask, but I don't think that you have understood my answer. There is no Rule that states that clublength(s) must be measured. A player may use any club (or no club) to determine the permitted area in which they must drop their ball within the Rules. This is the same for determining the NPR. The player does not have to use a club to measure, they may use any club to measure, but if they do not determine the NPR using the club which they would normally use for their next stroke if the condition were not there, they run the risk of incurring a penalty for dropping and then playing their ball from a wrong place. My ball came to rest in a nasty patch of grass right between a cart path and a out of bounds fence ( there was only about 1 foot of grass between the two). The npr from the cart path would have put the ball out of bounds( one club length could have gotten it back in bounds). The Npr from the fence would have put the ball onto the cart path. The nearest point of relief (NPR) must be on the course, it cannot be out of bounds. Also, there is no relief from an out of bounds fence. So, in the circumstance that you describe the player may play the ball as it lies, return to where they last played from under penalty of stroke and distance, or assuming their stance to make a stroke at their ball where it lies would be on the path, they may take free relief from that immovable obstruction by determining the NPR on the course and dropping within one club-length of that point, not nearer the hole. So if the npr within the course is on the other side of the cart path. A drop can be made there? In this case, the npr was outside the course boundary. The npr within the course would have taken it across the path. What I did -- took a unplayable-- dropped on the cart path-- both times rolled closer to hole. Placed on path, then took relief from the path. At that point the npr was on the "good" side of the path. Sounds like I could have saved a stroke by demonstrating the npr in the course was on the "good" side. Or I could have been wrong completely in how I played it. Did you even read my answer to your question? I started by saying, "The nearest point of relief (NPR) must be on the course, it cannot be out of bounds". Check the Definition of Nearest Point of Relief. You said, "My ball came to rest in a nasty patch of grass right between a cart path and a out of bounds fence." By this I assumed that if you played your ball from where it lay you would have been standing on the path. So, you were entitled to take relief from the path, which is an immovable obstruction. Without knowing the topography of your course I cannot be sure where this point was, but it was probably on the course side of the path. You were entitled to proceed as you did, deeming the ball unplayable for a penalty of one stroke and then dropping it on the path and taking relief from it. But if a reasonable stroke from where the ball lay would have meant standing on the path, even if you would have had to play the stroke away from the hole, you could have taken relief, without penalty, from the path. Ball lies to left of cart path but close to a water hazard. To hit ball as it lies player (left handed) is standing on cart path. Player wants relief. Player can take relief to left of cart path and can drop ball to a point where he is not standing on cart path and dropped ball is not in the Hazard however if he takes one full club length from nearest point of relief he could be dropping in the hazard. Consequently Player wants to drop ball on the right side of the cart path. is he correct? No. The relief that the player is permitted from the cart path is within one club-length of the nearest point of relief, not nearer the hole. So if they choose to take relief, the ball must be dropped in the narrow strip between the cart path and the water hazard. It is not relevant that this may result in them standing in the hazard, as it is not the hazard that they are taking relief from. If you are taking relief from a sprinkler head and the nearest point of relief is on the green can you drop on the green? I wonder could you clarify something about NPR and casual water please ? I'll try to describe the situation, so apologies if its not clear ! My ball was on the front of the green, say about 6 inches onto green, and about a foot or so in front of my ball was some casual water, quite a wide patch, maybe 10-12 feet wide, following the boundary of the green but about 2 feet inside the green if you know what I mean. Basically there was a dry strip of green before the ring of casual water and my ball was on this dry strip. Anyway we were unsure as to where my NPR was. If I went directly back only about 6-8 inches I would be off the green and therefore (I assume ?) no longer entitled to further relief from the casual water and would have had to chip over it, or if I was entitled to stay on the green, I would have had to move quite a distance to get a spot on the green that was not nearer the hole, probably 10 feet or so the side. I guess the question is if my ball is on the green and I need to move it because of casual water, am I entitled to stay on the green ? Hope I've explained that reasonably clearly ! Decision 25-1b/10.5 is relevant to your question and includes a useful diagram. The important point is that because the ball lies on the putting green, the player is entitled to relief with respect to the lie of the ball and intervention on their line. So, although the nearest point of relief may be off the putting green (unlikely) it is at a point where there is no casual water between the ball and the hole. Can a player take NPR from a cart path for just his ball while leaving his feet still on the cart path? He did not want to use his stance and club to determine the NPR, just the club. This gave him a more favourable lie. When a player takes relief from a cart path (immovable obstruction) they MUST take completed relief from the interference, which includes their stance, Rule 24-2a. See my blog of 2nd March 2011, on this subject. Also, my blog of 21st January 2014, describes how Rory McIlroy was penalised for a similar breach. If a local rule permits a free drop from a man-made alteration, I.e. Deep drainage slits, does that include dropping on the fairway, within 1 club length, when your ball lay in the semi-rough or your ball bouncing onto the fairway, still within 1 club length? Unless the wording of the Local Rule states differently, the player may drop anywhere within one club-length of the nearest point of relief, not nearer the hole, that is not in a hazard or on a putting green. This may mean that the player has the option of dropping onto the fairway or semi-rough and then playing from where the ball comes to rest, providing this is within two club-lengths of where it first hit the course after being dropped. I am not sure that I understand the circumstance that you describe. If your natural stance for a stroke is on a cart path you are entitled to take relief without penalty. First you must determine the nearest point of relief (NPR) from the cart path, which may be in bushes. You may then drop a ball within one club-length of that NPR, not nearer the hole. If the ball comes to rest on the path you have to drop again and if it comes to rest on the path after the re-drop you must place the ball where it first hit the course after the second valid drop. A question that looks theoretical, but I exprerienced the situation myself when playing on a very rough-rocky golfcourse in Norway. According to the rules, I was allowed to take relief from an obstruction, but the NPR was within one of the BIG rocks on the course. A 1 clublength semi-circle was fully within that rock, impossible for a ball to be dropped and hit the course within the 1 clublength from the NPR. We were playing for fun, so I took a Mulligan to solve the situation, but what should I have done to play according to the rules ? As there was no way that you could take free relief from the immovable obstruction under Rule 24-2, your only options were to play the ball as it lay, or deem it unplayable and take one of the 3 options afforded by Rule 28. Golfers are often faced with a situation where the nearest point of relief is in an unfavourable (or impossible) position.